The palm tree is a highly useful tree. The tree grows to a height of about eighty feet. 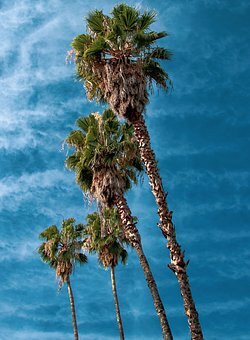 The sap of the palm tree was used to make sugar. Its fruit was edible and nourishing. The seeds from its fruit were used to feed the camels. The leaves were used as a covering for the roofs of houses. The palm tree was used to celebrate the Feast of Tabernacles (Leviticus 23:40). The palm tree is symbolic of righteousness (Psalm 92:12). The palm tree denotes victory (Revelation 7:9). It is Revelation, chapter 7, I want us to look at for the sake of the devotion. The palm tree is symbolic of victory. Each of us, as a believer, is ultimately victorious over sin because of Jesus Christ. Please note the following. Walking through a park, I passed a massive oak tree. A vine had grown up along its trunk. The vine had started small – nothing to bother about. But over the years, the vine had gotten taller. By the time I passed, the entire lower half of the tree was covered by the vine’s creepers. The mass of tiny feelers was so thick that the tree looked as though it had innumerable birds’ nests in it. Now the tree was in danger. This huge, solid oak was quite literally being taken over; the life was being squeezed from it. But the gardeners in that park had seen the danger. They had taken a saw and severed the trunk of the vine – one neat cut across the middle. The tangled mass of the vine’s branches still clung to the oak, but the vine was now dead. That would gradually become plain as weeks passed and the creepers began to die and fall away from the tree. How easy it is for sin, which begins so small and seemingly insignificant, to grow until it has a strangling grip on our lives. And yet, Christ’s death has cut the power of sin. Yes, the “creepers” of sin still cling and have some effect. But sin’s power is severed by Christ; and gradually, sin’s grip dries up and falls away. So the next time you see or hear of the palm tree, remember your victory through Jesus. ✞ Remember the palm tree is symbolic of victory, and victory for us comes through Jesus Christ.